A thought expressing that metal roof is equivalent to steel roof is misleading. The term concerning it covers a vast variety of metal-based roofing products. The sort of material you are going to install hinges on your geographical location and weather condition. Salty regions would be best with aluminum while the rests go greatly with copper. To help you make your mind up, this following information about types of metal roofing could be something of use. Aluminum roofing could be such a wonderful preference to those inhabiting a region with coastal climate. In comparison to other metal materials, aluminum is highly resistant to salt corrosion. It’s very active in getting over the salty situation. The outer layer of the shiny metal induces aluminum oxide once touching the oxygen. Don’t you know that the reaction outcome is exceptionally effective in protecting the inner layers? Not only is it anti-corrosion but aluminum is corresponding to the system of residential metal roofing. It’s friendly to your slate profiles, shingle, and other important roof parts. Its distinctive property that is not easy to rust makes it durable. Speaking of heaviness, it’s such a lightweight choice. Now, it’s already pre-painted in the manufacturing factory. In the end, metal kind successfully turns your roof into something stylish and attractive. Apart from the advantages, aluminum roofing comes with some cons. Yes, it’s highly resistant to corrosion problem, yet it’s susceptible to hail and wind. Homes in a windy area are not supposed to have this. It’s also more expensive compared to steel. Moreover, the mass production is relatively too thin due to the high cost of raw material. Out of metal roofing options, copper is likely the most beautiful kind. That’s why it’s incredibly popular among homeowners. A green pigment named verdigris patina is the guy behind the amazement. Although it’s not quite dominant in the residential steel roofs, it becomes the ultimate limelight adding the accent impression on either dormers or bay windows. The copper is found to be elegant adorning the details of church steeples and historical construction. The most interesting part that copper roofing has to offer is its extreme longevity. Its long life can stay for more than 100 years. When it comes to texture, copper is extremely malleable. It might easily get dent meaning that the metal is prone to get some damage when hail comes. Fortunately, the modern installation tells a different thing. The proper substrates have been included in it. The negative side of the copper is somehow it easily contracts and expands when it’s hit by drastic temperature. Additionally, it’s not recommended to install it along aluminum of other steel options. Why it’s considered harmful to others as it’s active in galvanic action. It usually results in water runoff making brick and other metal elements get a stain. Your building deterioration goes faster. Out of popular metals, copper is overly pricey. Steel roofing also becomes one of the most well-liked options in the industry of commercial construction. Steel fits with your green project. You have to that the components in it can highly be recycled. About the price, steel roofing is affordable, and it’s abundant regarding quantity. In short, there are three key types of steel products of roofing – galvanized steel, galvalume steel, and not to mention the weathering steel. Galvanized steel is made by befitting the layer of zinc. The coating property is beneficial to make better protection of the inner part of metal and keep off the corrosion matter. It appears to be most well-known among all. Galvalume steel applied in galvalume roof has a similar character with the galvanized sort. The difference is that it combines two metals – zinc and aluminum. The strength of it is that it provides more surface protection. Moreover, being easily scratched is its weakness. Weathering steel is not quite accepted in home design, and it’s used in bridge construction instead. The working system in shielding the inner part is as same as the aluminum. Manufacturers design the product uniquely making it easy to rust. Let’s go back to the advantages of steel roofing. As it is made of the hard element, its high resistance toward climate threat and weather condition is not to question. It can deal with hail and wind elegantly. It’s compatible with homes in a mountainous region. In a nutshell, zinc is one of the metal roof types that has a super quality to heal itself from scratching issue and is long-lasting for many decades. According to a credible source, it can survive for more than a century. Zinc is often used in some commercial projects owing to the facts that this metal can be shaped and manipulated. In addition to that, it’s known for its lower melting point. Moreover, how it’s in accordance with healthy living style highlight “go green” concept is nothing yet obvious. 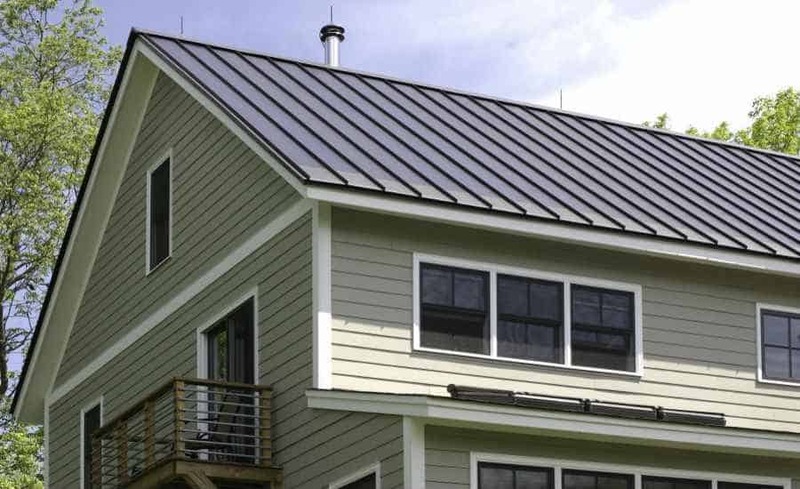 The negative side of zinc roofing is seen both the price and aesthetic value in it. Compared to other metal-based materials, zinc is arguably costing an arm and a leg. Furthermore, it frequently generates a chalk residue giving a blue appearance that looks a bit disrupting to your roof look. The installation of it requires a professional meaning that you need to provide extra money to hire the people. Planning to go with the DIY roofing project? Tin could be one of the nicest alternatives. Although its existence is quite rare and not often applied to the roof, tin is so famous in the northern part of the American continent. In the rural areas, it is used as canning material as well as a shingle. Unfortunately, it doesn’t provide various shades. If you want to liven up your roof, you can’t leave the sheet metal roofing out. It goes with an abundance of metal roof colors from aged bronze to terra red. In conclusion, copper roofing can be the one that looks so striking, yet its price is costly. Meanwhile, zinc is a great addition out of types of metal roofing making your green project run smoothly. For affordability, steel shouldn’t be missed out.